Falls colors always amaze me. I love the cold weather--the little nip in the air that comes with fall mornings. I am not a fan of the yardwork, but I do love being outdoors this time of year. Lately, the weather has been rainy and cold. 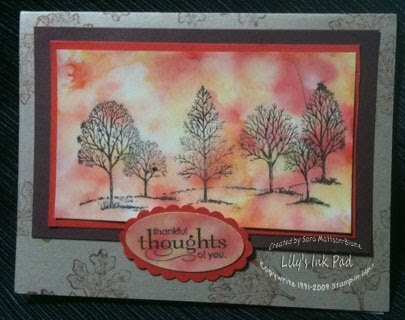 I miss the October I love, so I am getting my fall colors in my stamping! The technique called Polished stone was modified for this project, as I lacked an ingredient many people use- a metallic reinker. I skipped that step, and just daubed on my reinker. I found it easier to cover a whole page, then cut out my images. I find this a unique background, great for this kind of project. I can also almost picture a tye dye shirt card in my future! Don't Get the Staples Confused!